The INM presents hybrid inks for inkjet printing that contain metal nanoparticles coated with conductive polymers. 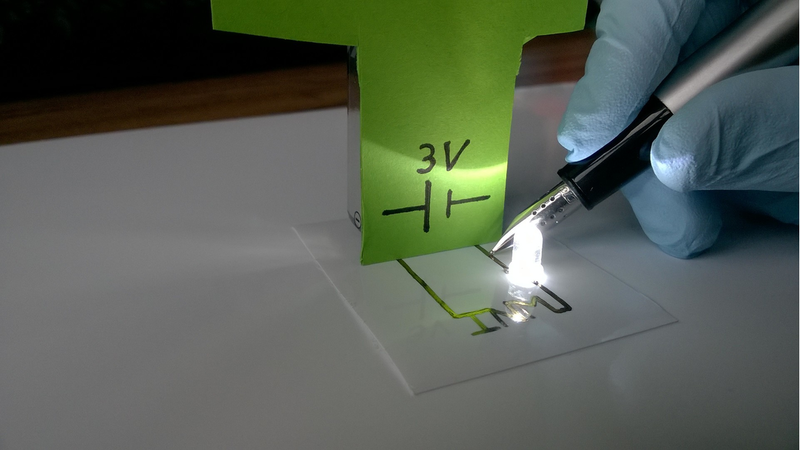 The inks can be formulated in water and in other polar solvents and are suitable to print conductive structures on a range of substrates without any subsequent thermal or UV treatment. Standard metal inks require annealing after inkjet printing to become conductive. INM’s new inks obviate this step, making them compatible with many substrates including thin polymer foils and paper. The inks presented by INM are applicable to flexible photovoltaics, lighting, touch screen electronics, wearable devices, large-area heaters, sensors, and 3D conformal antennas, among others. The inks are based on gold nanoparticles with good biocompatibility and low toxicity (FDA “generally regarded as safe”), suitable for health and biomedical applications. Immediate conductivity upon drying, mechanical flexibility, and good biocompatibility are important properties of these inks, They contain a small organic polymer fraction that helps to maintain its electrical conductivity, even if the substrate material is bent. This enables printing on almost any substrates, like foil, paper, or textiles, since the final annealing steps at relatively high temperatures are avoided. INM scientists have scaled the production of these hybrid inks to a level that is sufficient for small-scale production. Samples of the material are available for testing upon request.